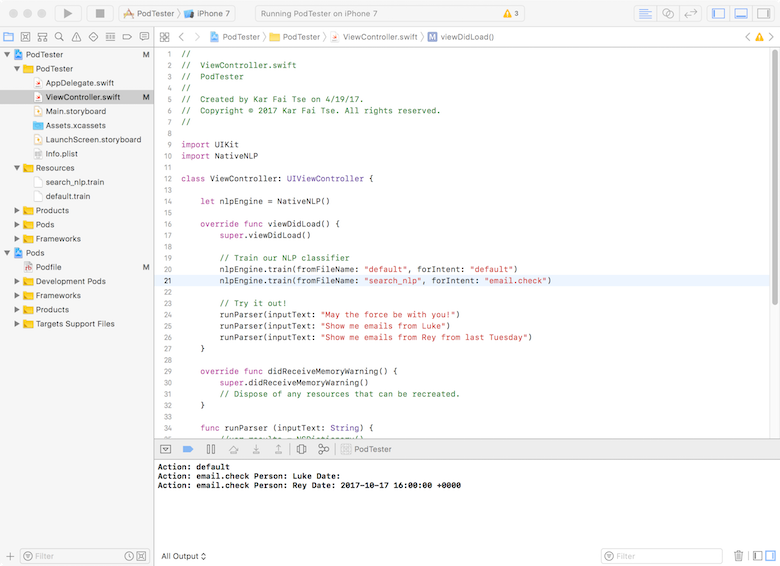 Simple Natural Language Processing for iOS provides developers with a convenient framework for integrating Natural Language Processing (NLP) into their iOS Apps. When the developer provides a set of training phrases, Simple NLP will use Naïve Bayes Classification to predict the intent of an unfamiliar phrase and extract parameters such as a person’s name and dates. While numerous cloud based solutions already exist to provide similar functionality, they may have associated cost and privacy concerns. With Simple NLP for iOS, your data won’t be sent to a server or cloud service for prediction. All NLP functionality is constrained to the device and processed natively. We hope that you will find this Fling easy to use and beneficial to your project. Within your training file add some example phrases to train on. Use at least 10 phrases for better results. Naïve Bayes requires balancing between each Intent. Your defined intents are treated as positive, while default intents are treated as Negative. So, if you have 10 phrases for each positive intent, you will need at least 10 default or negative phrases. These should be phrases that could be extracted from a random source, i.e. Reuters, IMDB, or Twitter. Once training files has been populated, you’re ready to use NativeNLP pod.